tile above it has disintegrated from the spray. It's a terrible feeling. 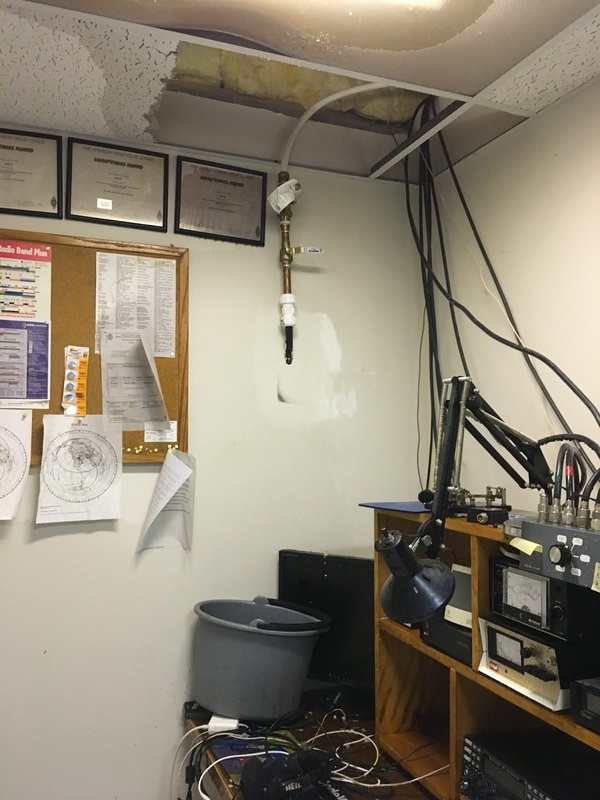 You're walking into the basement to grab some hardware right before going to work, and you are greeted with huge puddles of water on the basement floor. 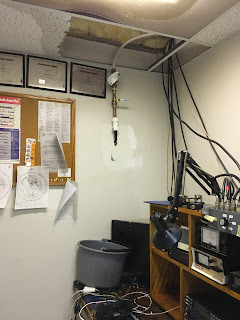 Looking for the source, you find the pressure reducing value (also known as the regulator) spraying water all over your ham radio gear. Oh no! The next several minutes, I hardly knew what to do. I shut the water off immediately, then called my wife to see who our preferred plumber was. Then I mislaid my phone so I couldn't call anyone for a while. I had to get my daughter to look for my phone. During this time, I'm working hard. I'd cleared out the shack and mopped up the water, vacuumed the water off the basement floor, thrown out the few soaked cardboard boxes. Then it came to determine how to salvage my soaked equipment. I decided to take an ancient tip and placed my Elecraft K3/100, plus a few other pieces of gear in the kitchen oven for an hour at 150 degrees F. This temperature wouldn't hurt the electronics, but it would drive out any water that had gotten into the gear. By about 1:30 PM, the plumber replaced the regulator, and lightened my wallet by $325. Later in the day I tested the K3, and it seemed to be working fine. I suspect, other than some papers I had on the desk, nothing will suffer any lasting damage. That was Friday. Monday night, I'm putting the pieces of my shack back together. So far, everything seems to be working. Whew!